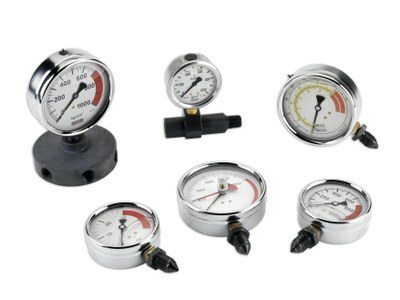 High accuracy gauges. Class 1.0 ref. AV10008, AV10010 and digital gauges. Class 1.6 other references. Essential for monitoring working pressure or force. Available as system pressure gauges or as dual scale gauges to load measure load on specific cylinders. All references have 3/8″BSP thread, except AV10006, 1/4″NPT thread. Gauge adaptor AZ1502 for AV10006. For other references, AZ1501. Available digital pressure gauges AVD07008 (700 bar) and AVD10008 ( 1.000 bar). Gauge adaptor: AZ1507. Available pressure transducers AVT with software up tp 3.000 bar. Adaptor AZ1507 up to 1.500 bar.